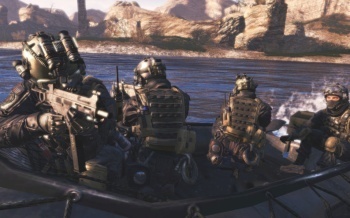 38 current and former Infinity Ward employees have filed a huge lawsuit against Activision, alleging that the company is withholding bonuses in order to "keep them hostage" and force them to work on Modern Warfare 3. The issue of bonuses owed to Infinity Ward employees for the success of Modern Warfare 2 has been a sticky one since the IW/Activision debacle began back in early March. Activision accused fired Infinity Ward co-founders Jason West and Vince Zampella of fomenting unrest by taking an "inordinately large share of the bonus pools" for themselves while leaving little for other employees, and last week revealed that the "very large bonuses" owed to the pair would instead be redistributed among employees who stuck with the studio. But a collection of 38 past and present employees calling itself the Infinity Ward Employee Group has other ideas: It has filed a lawsuit against Activision claiming between $75 million and $125 million in compensation, a figure which includes various unpaid bonuses from Modern Warfare 2, lost value on "restricted stock units," money owed for "sister games" including the in-progress Modern Warfare 3, interest on all of it and more. And that's not all: The suit also seeks another $75 to $500 million in punitive damages, a number based on the huge revenues generated by Modern Warfare 2 and "Activision's net worth." "Activision has withheld most of the money to force many of my people to stay, some against their will, so that they would finish the delivery of Modern Warfare 3," claimed Bruce Isaacs, one of the lawyers representing the IWEG. "That is not what they wanted to do. Many of them. My clients [are] entitled to their money. Activision has no right to withhold their money - our money." The group claims that the only condition attached to the bonuses was the on-schedule launch of Modern Warfare 2, which took place as planned on November 10, 2009, yet Activision still refuses to pay up. "In short, Activision withheld the property of the IWEG in an attempt to keep the employees hostage so that Activision could reap the benefit of the completion of Modern Warfare 3." Unfortunately for Activision, its "bonus redistribution" incentive (or blackmail, depending on your perspective) didn't do much to staunch the bleeding - at last count, 26 employees have left the studio since West and Zampella were canned, with nearly half that number following them to their new venture at Respawn Entertainment. The situation has grown so bad that one analyst has predicted that in spite of Activision's brave words, Infinity Ward has pretty much had the biscuit. "Continued defections from their Infinity Ward studio have created meaningful uncertainty around the future of their Call of Duty: Modern Warfare franchise," Janco Partners analyst Mike Hickey told Gamasutra. "We expect Infinity Ward studio will be essentially closed after their next map pack release, with development work on Modern Warfare 3 spread between two studios not historically tied to the franchise."